During the six decades that we have been bringing unique event visions to life, our professional wedding planners have had the pleasure of embracing a lot of different wedding themes. And, to this day, the rustic wedding trend remains one of our favorites. Filled with charm, elegance and personal touches, each rustic wedding dream is uniquely beautiful and memorable. If you are one of the many tri-state area couples who have fallen in love with a rustic wedding theme, then you are in the right place. Our trusted tri-state area catering team has access to everything you’ll need to cultivate your desired atmosphere and experience. Whether you are looking in Monmouth County, Red Bank, Hazlet or beyond, when it comes to rustic wedding venues, the tri-state area has no shortage of ideal locations. Some of them are well-known and wildly popular, while others are hidden gems. 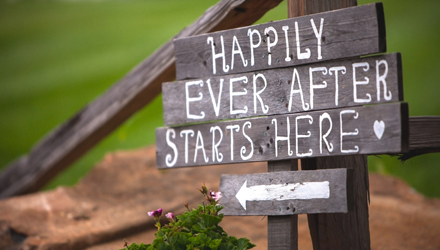 Our experienced wedding planners know all the best rustic wedding venues inside and out, and they are excited to help you explore your options. If one of these incredible venues doesn’t catch your eyes and heart, then you may begin to gaze out at other ones—maybe even your own backyard! Feel free to let your imagination soar, because we love to transform any venue to match your vision. Just check out how Erika and Russ enjoyed their rustic wedding at Breezy Ranch in Branchville! Whatever your budget is, we have creative rustic wedding ideas to match it. From rentals like antique farm tables, vintage furniture and wine barrels to exquisite decorations made using burlap and mason jars, we work with partner vendors to weave your personal touch into any space. So imagine your centerpieces, guest table, dining area and more, because anything you can dream of we can make happen. When you have experienced culinary experts in your corner and more than 70 specialty items to choose from, designing your custom menu is a pure joy. Relax as you preview our elegant wedding menu or maybe our smokin’ BBQ buffet to get an idea of the wonderful rustic wedding food available to you. Our BBQ grill package with choice of fine entrees like our flame grilled breast of chicken with wild mushrooms and white truffle oil cream sauce or summer mango salsa as well as our New York strip steak grilled to order and topped with red wine and shallot butter are popular choices. 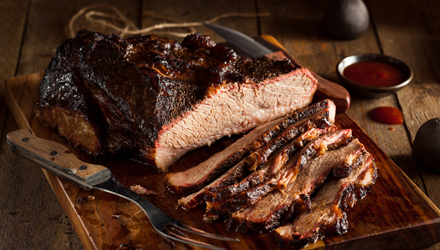 But maybe you love the idea of our “pit masters” cooking flavorful and tender meat smothered in our secret barbeque mops and rubs low and slow over smoldering logs of hickory and cherry woods. Then a rendition of our smokin’ BBQ buffet might satisfy your cravings. When it comes to your wedding cake and dessert station, you may be imagining a naked cake and mini desserts displayed on wood rounds. We love these pairings, and we encourage you to consider creatively displaying your other menu items as well. Think along the lines of wooden boards, cast iron pots and hammered stainless steel. Rustic weddings do come with their challenges, but fortunately our experienced experts are quite familiar with them and can help you make them non-issues. Your wedding planner will be able to give you insider tips and reminders of things you may have forgotten. For example, citronella candles and torches as well as bug spray are essential to guests’ comfort at most rustic wedding venues. You might also need to prepare for you and your guests to walk across potentially moist lawns! 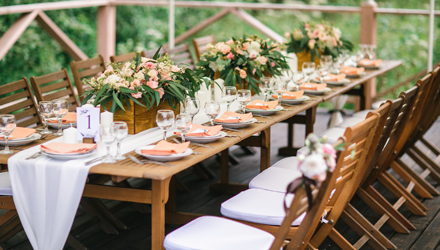 From arrival to send-off, our wedding experts ensure your rustic wedding plans run flawlessly. Secluded and naturally beautiful wedding locations should only enhance your wedding day! We lost count of how many rustic weddings dreams we have cultivated since the trend really took off. Dozens of dreams have come to life, and each in unique ways that are an expression of the couple and their story. Rest assured that your event planner knows what it takes to ensure every guest enjoys a pleasurable and memorable experience. From sourcing electricity and securing licenses/insurance to preparing for inclement weather, your expert wedding planner is on top of everything so you are stress-free when your glorious day arrives. Ready to expand upon your rustic wedding ideas? Contact us online or give us a call at 866.522.7873.